An advanced driving topic from SafeSpeed. One cause that may be very significant is that windscreen pillars obscure drivers' vision. 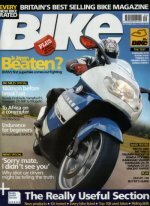 Safe Speed has been working with BIKE magazine to highlight these issues. A three page article was published in BIKE on the 4th August 2004 and a joint press release was issued. “‘Looked but failed to see’ has been shown to be a major cause of car/bike collisions and BIKE's investigation has unearthed what is probably a major part of the problem. Modern cars are fantastic at protecting the occupants of the vehicle and this is where manufacturers have spent most of their safety budgets to the detriment of ‘outsiders’ i.e. pedestrians, cyclists and motorcyclists. Volvo have obviously already recognised the A pillar problem and due credit must go to them for their see-through project, but if they've recognised it, so have others, it's just that no one else is addressing it. It has taken legislation to make car manufacturers even consider impact with pedestrians and this is now being measured under the NCAP (New Car Assessment Programme) system, but NCAP is primarily about occupant safety, as they say in their literature, ‘safety sells cars’ but that's secondary safety, they do little to help drivers to avoid the crash in the first place. In fact driver complacency is reckoned to be a down-side of improved occupant safety. “Bike's article is timely given increased motorcycle safety concerns. MCI has long suspected that the screen pillar issue is one which needs attention drawn to it and are glad that PACTS and others share the same view. It has to be accepted that passenger protection will remain a priority for car manufacturers -- as it is for the public -- and we look to car manufacturers to continue to develop visibility solutions to this issue. However, such protection should not come at the cost of primary safety and it seems clear that once again car driver standards are under the spotlight -- a huge screen pillar does not divorce drivers from their responsibility to ensure that even with this limitation, they take care on the road and look before they pull out into the possible path of other vehicles, taking into account the fact that something may be hidden in the blind spot -- there is simply no excuse for not doing so. Motorcyclists also have a responsibility to take note of 'Bike's' Article and remember that the driver at the junction ahead may not have seen him or her. It's not enough to simply go on about blame after the accident has happened and you're in hospital -- or worse. Riders need to take care that their riding mitigates the risk of accidents and this means looking out for careless or thoughtless car driving. "Car manufacturers should do all they can to minimise blind spots caused by A-pillars. But drivers must also take the time to look properly at junctions and move their heads so they can see into any blind spot created by the A-pillar to make sure there isn't another vehicle or two wheeler hidden from their first glance." The ABD strongly supports the initiative and recognises the dangers of modern windscreen pillars, especially to pedestrians and motorcyclists. Mark McArthur Christie, ABD Road Safety Spokesman and BMW R1150GS rider said: "With modern screen pillars seemingly becoming wider and wider it's hardly surprising that there will be a dangerous effect on drivers' ability to see other road users in good time. What is surprising is that the official road safety establishment has taken their eye so far off the ball that this danger has neither been spotted nor investigated. The DfT must now embark on a campaign to bring this danger to the attention of road users"
road safety problems such as this one. Clearly it's high time that the road safety establishment pays full attention to the analysis published by Safe Speed"
Recent government research indicates that 19.7% of 61,000 accidents were contributed to by road users who "looked but did not see". With some 250,000 injury accidents each year we think it likely that screen pillars play a part in tens of thousands of injuries annually. These accidents especially affect motorcyclists, who experience the risks so frequently that the usual words of the car driver involved: "Sorry Mate, I Didn't See You" have been shortened to the acronym: SMIDSY. Many motorcycle accidents involve cars and other vehicles simply "pulling out in front". It is so common that the driver's typical words to the motorcyclist; "sorry mate, I didn't see you" have been shortened to the acronym "S.M.I.D.S.Y." Well actually he probably did. Most smidsy accidents involve drivers who "looked but did not see". Where'd he go? I had my headlight on! How could he miss that? Although it isn't well known, even quite large vehicles can momentarily disappear behind the driver's windscreen pillar. If their momentary disappearance coincides with the driver's "glance check" a smidsy is on the cards. It's clear. Let's go. But your camera has only got one lens. I've got two eyes. It's true that sometimes, even often, your other eye can see around the pillar. But not every time, and then each of your eyes has a blind spot where the optic nerve joins the retina. So if the left eye view is blocked by the pillar and the biker is in the right eye's blind spot we might just have a smidsy. ...are shot with a cheap ordinary video camera, captured with a cheap ordinary TV card. Converted to 15 fps and dumped out as single frames. We've then used every other frame for the sequence on the left. The frames are at a rate of 7.5 frames per second or an interval of 0.13 seconds per frame. Hang on, there's a motorbike! Suppose we'd just started moving. See how the pillar could track the motorcycle and keep him hidden for longer? What should a driver do? Always, always, always look for long enough that anything moving behind the pillar has a chance to emerge. Glance checks are never enough. An extended period of observation is good, two looks are better. Always think about bikes. Always think about anything that could be behind the pillar. Move you head to see around the pillar, but be aware that doing so could also mean that you make an equal and opposite head movement allowing the pillar to obscure the biker for longer. Good job we saw him! (phew) How long was he invisible? As near as we can reckon the motorbike was hidden behind the windscreen pillar for about 0.35 seconds. Careful now, there might be a bike! They used to say: "Think once. Think twice. Think bike". Good advice, but we were never sure if they really knew why they were giving it. What are we going to do about it? TELL DRIVERS. Shout it from the roof tops. Link to the web site. Get it on TV. In the papers. In the driving manuals. In The Highway Code. email your car driver friends. download: (308k bytes) smidsy.avi click the link to download the above sequence of frames as an avi file: 15 frames per second. I drove to the nearest roundabout. It happens to have a small little used service road. I parked in the service road positioned exactly as if I was going to pull out onto the roundabout, but 6 feet back from the give way line. I determined my normal head position in the driving seat, got into the back of the car and hand-held the video camera so the the lens was between where my eyes normally are. I adjusted the zoom to a reasonably wide angle and filmed for ten minutes. I was lucky that the two bikers happened along. I was back home in less than 30 minutes. Some claim that you only see the types of object that you are looking for. e.g. while checking to see if there's a car coming you may not see a bike. This is clearly possible, but we don't presently believe it's a big smidsy causation factor. Every human eye has a 6 degree blind spot where the optic nerve meets the retina. Normally the other eye can see the portion of the view where the first eye is blind. Our brains are incredibly sophisticated at "cleaning up" the information from our eyes. New government report into "Looked but failed to see accidents". Retinal blind spot everyone has two. You could argue that the most important faculty for drivers is to be able to see where they are going and, just as important, what is coming towards them. The motor industry has spent billions on making cars safer and cleaner. But, according to one of Britain's top car engineers and designers, Spen King, designers and legislators are overlooking a potentially lethal blindspot in modern cars loaded with seat belts, airbags, side-impact beams and all the other fashionable safety paraphernalia. He is convinced that windscreen pillars have been allowed to become so thick and obstructive to vision that they are leading to many accidents. He says there is no real engineering reason for them to be so wide, and few drivers are even aware of the hazard until they have a near miss (or worse) with a vehicle, cyclist or pedestrian they inexplicably failed to see. King, who was engineering chief at Rover, then BL, and responsible for the Range Rover and Rover 2000 among other outstanding designs, believes there has been so much emphasis on secondary safety - protecting the car occupants from the worst effects of an impact - that some of the fundamentals of primary safety (avoiding the crash in the first place) have been overshadowed. He traces the problem back to an EEC regulation from 1977 allowing obstruction of up to six degrees, using both eyes, from the driving seat, applying to both driver and passenger screen pillars. "It means it is legal to have pillars so thick that at 50m, an object 5.2m wide (17ft 2in) can be completely hidden from the driver," he says. "The EEC safety rules, when satisfied, seem somehow to relieve car companies of ethical or potential legal pressure that they might otherwise feel, so it is not surprising that screen pillar design has gravitated towards maximum legal thickness, although some car companies are exceptions." King quotes a wad of accident investigation data indicating that forward vision restriction may be a factor in more than half of all collisions. One source reported that the offside screen pillar could obscure a pedestrian 10m or more away; another found that "most traffic events occur at 30 degrees to the straight ahead". "This is a position where the offside windscreen pillar is normally located," says King. The danger was brought home to him when he stopped to let some pedestrians over a crossing. "I thought they were all clear; then, as I moved off, I found some more ha d followed behind them. They were hidden behind the screen pillar, and I had to jam the brakes on again." Other potential danger spots were junctions, roundabouts and right-hand bends. "Of course, if the driver moves his head he can see round the pillar. However, my observations and experience make me think drivers very often don't do this." King believes the Transport Research Laboratory should look into the visibility problem "While car companies spend many millions on things like cleaning up emissions, here is something relatively inexpensive that might save thousands of lives, but nobody seems to be doing anything about it," he says. "Given a new design from scratch, the visual obstruction of screen pillars could be massively reduced. However, he says, since getting European agreement to revised regulations could take years and would apply only to future new cars, it is essential to take action now. Car makers should be reminded of the importance of having unobstructive pillars on new models, and of reducing obstruction as far as possible on current vehicles. King believes the Transport Research Laboratory should look into the visibility problem instead of concentrating so heavily on secondary safety. Just as important, drivers should be made aware of the hazard and get into the hab it of moving their heads to see round the screen pillars. "Even the Highway Code makes no mention of the screen pillar blindspot - it should," says King. "And so should the otherwise excellent Roadcraft police driver's handbook." new Solutions - what must we do? Car drivers have the greatest responsibility - at least until we have better designed screen pillars. DON'T make a "glance check" then go. DON'T Look around the back of the screen pillar - always look around the front. This is because of the risk of "opposite tracking" another road user on a conflicting path. Take the case of the offside pillar - if another road user is moving towards you, and you move your head right to look around the screen pillar the risk of opposite tracking is considerable. On the other hand, moving your head left to look around the screen pillar is unlikely to opposite track another road user on a conflicting path. An easy way to remember this is to always enhance your view through the windscreen, not the side windows. DO be aware of the screen pillar obscuring your vision. DO - And this is the best tip of all - always look twice. If another road user was behind the pillar on either check, then there's an excellent chance that they will have emerged when you make the second check. Normal procedure for pulling out of a side road, left, into a main road is as follows: Look right, look left, look right again, look left and drive off looking in the direction of travel. Always be aware of the risk of not being seen and never forget that it will hurt if someone does manage to pull into your path. Look at emerging drivers - if part of his face appears behind the screen pillar it's possible that you can't be seen. Assume that emerging vehicles may pull into your path and position for maximum margin. Usually this means taking a position towards the crown of the road if someone might emerge from the left. Don't assume that you have had eye contact with a driver from 20 feet away or more. It might look like eye contact, but you STILL can't be sure that he's seen you. Don't assume that because you have high visibility clothing and your headlight on that you are visible - if there's a screen pillar in the way, visibility aids don't work. Watch the wheels of potentialy conflicting stationary vehicles. You can recognise wheels starting to turn sooner than you can recognise other movements. Ensure that drivers and riders are getting the message. Ensure that the authorities are doing their bit too. Tell drivers and riders about the risks. Research the effects of screen pillar obscuration on real world accidents. Create and enforce standards for vehicle design to ensure reasonable drivers' vision. Design vehicles in accordance with the spirit of the regulations. Test designs for vision problems. Find solutions to ensure that adequate strength is combined with excellent drivers' vision. It is outrageous, but sadly all too typical, that the risks associated with screen pillar obscuration of vision are not even considered in modern road safety research. Being able to see other road users is absolutely fundamental to the way road safety works in practice, but the UK authorities are not even asking the question.